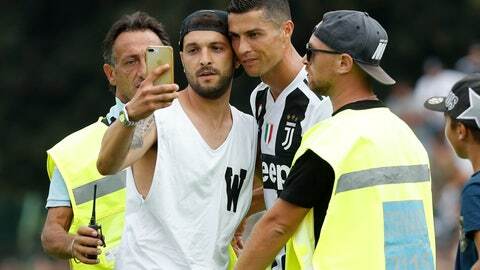 VILLAR PEROSA, Italy (AP) — Cristiano Ronaldo made Juventus fans wait only eight minutes before scoring his first goal for the club in a traditional pre-season friendly against the team’s “B” side on Sunday. Juventus fans gathering to watch the five-time Ballon d’Or winner at Villar Perosa — in a rural area of Piedmont in northern Italy — held up banners. One said “Welcome Ronaldo” and another had his face on it and simply read CR7, in reference to the jersey number Ronaldo made famous as a Real Madrid player. Ronaldo stunned Madrid fans last month when he joined Juventus for an Italian league record sum of 112 million euros (now $128 million). The 33-year-old Portugal international will likely make his proper debut in Juve’s first league match of the season at Chievo Verona next Saturday. He moved from Manchester United to Madrid in 2009, and became the Spanish club’s all-time leading scorer with 451 goals in 438 matches. He helped Madrid win four Champions Leagues titles — beating Juventus in the final in 2017 — and also won La Liga and the Copa del Rey twice. The storied Italian club hopes signing Ronaldo will help it add to the European Cups it won in 1985 and ’96. Juventus has lost five finals since its last European Cup success.